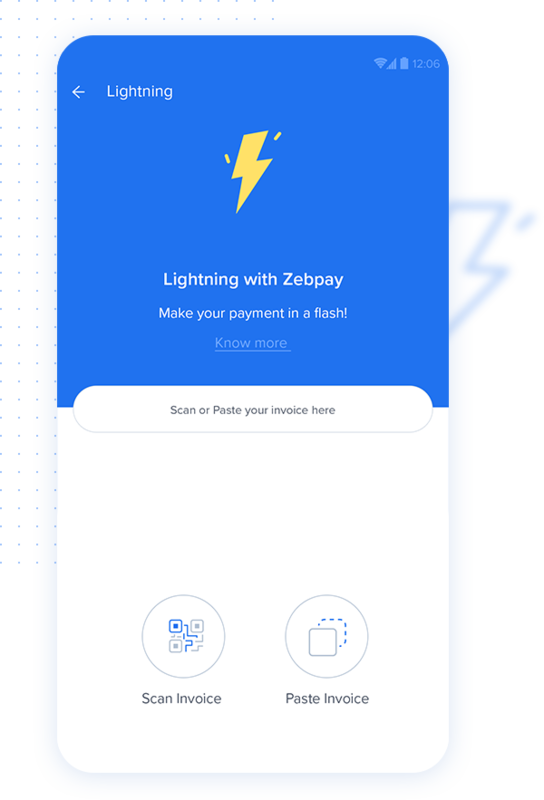 Make payments on the Bitcoin Lightning Network with Zebpay. We’re Zebpay, and we’re all about setting cryptos free. So while we’ve gone ahead and liberated cryptos from the shackles of trading fees, we’re pretty certain there’s a lot more that needs to be done to achieve our crypto end goal - taking Bitcoin usability to the world. It is in that very endeavour, that we’re proud to announce yet another breakthrough from the Zebpay universe - Lightning Network Payments! That's right, you can now login to your Zebpay App and make payments on the Lightning Network to buy products & services from stores across the globe. With Lightning, the future of transactions is here. This new protocol built on top of Bitcoin allows Lightning-fast micropayments without worrying about confirmation times. It opens up instant, cheap, peer-to-peer Bitcoin payments that aren’t possible anywhere in the current financial system. You can buy virtually anything. Just identify the store, copy and paste the invoice of the product or service you would like to avail from within your Zebpay account and hit send! Watch your Bitcoin payment shoot across the mainnet in milliseconds. Of course! Use the demo link to experience Lightning on the Bitcoin Testnet to get an idea of how fast Lightning works. Is there a limit to the amount of crypto I can send? At the moment, we’re allowing a maximum of 0.002 BTC per transaction and upto 10 transactions a day, which should allow you to get going with your daily needs. These limits will continue to be revised as we move ahead. What charges will I have to pay for a Lightning transaction? There are no charges to pay using Lightning via Zebpay #setcryptofree.